CD44 antibody recognizes CD44 antigen, also known as CDw44, epican, extracellular matrix receptor III, ECMR-III, HUTCH-I, phagocytic glycoprotein 1, PGP-1, phagocytic glycoprotein I, PGP-I or CD44. The antibody has been extensively validated for western blotting using whole cell lysates. Mouse anti Human CD44 antibody recognizes human CD44, a 742 amino acid, type I transmembrane protein which is otherwise known as HCAM, epican or CD44s. Multiple isoforms of CD44 exist, generated by alternative splicing within a single variable extracellular domain (Jackson et al. 1992). The standard form of CD44, recognized by Mouse anti Human CD44 antibody, is expressed on leucocytes, erythrocytes, white matter of the brain and some epithelial cells of the breast and small intestine. Mouse anti Human antibody binds to a protease resistant epitope on the CD44 molecule. CD44 is a receptor for hyaluronic acid (HA) and is involved in cell-cell interactions, cell adhesion and migration. CD44 also participates in a wide variety of cellular functions including lymphocyte activation, recirculation and homing. CD44 expression may be up-regulated upon some carcinomas, and it has been speculated that this may be related to metastatic potential (Hofmann et al. 1991). 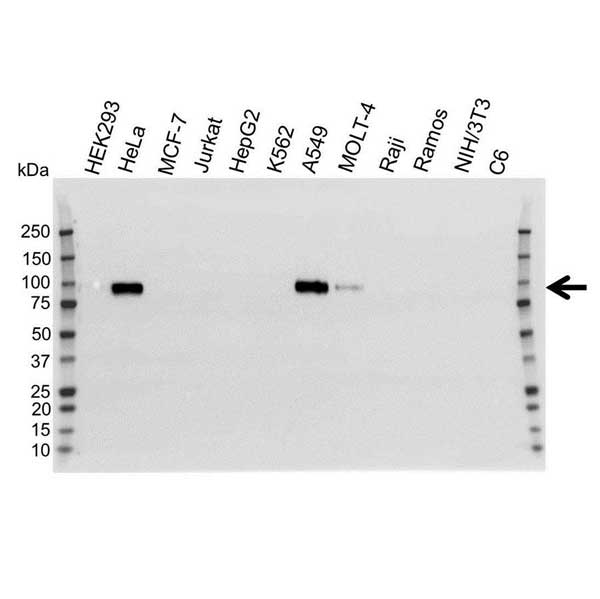 Mouse anti Human CD44 antibody recognizes the standard CD44 isoform lacking any of the variable region exon products as a ~82 kDa band in HeLa cell line lysates by western blotting under reducing conditions. In addition, Mouse anti Human CD44 antibody will recognize all higher molecular weight forms of CD44 containing one or more of the variable region exon products. Anti CD44 antibody detects a band of approximately 82 kDa in HeLa cell lysates.